No one worried about GMOs is eating Campbell’s Soup. It’s “processed” food. Campbell Soup Co. now has the very people who hate them defending them. No one who understands science is going to stop eating Campbell Soup. It will be interesting to see if, Michael Pollan– author, yellow corn journalist (2), and penner of languid linguistic amuse-bouches that foodites dutifully repeat as though they were really wisps of wisdom and not self-indulgent bits of twaddle such as: “If it came from a plant, eat it; if it was made in a plant, don’t.”–will deign to buy a can of Campbell’s Soup. He might. Probably to use as a paper weight. Yes. A can of Campbell’s Minestrone as a paperweight, because it’s only a foodlike substance. What an extraordinary achievement indeed! Due to technological progress (that includes food technology) we are healthier, happier, wealthier, wiser, kinder, and freer than at any time in human history. Let us ditch what the French call a nostalgie de la boue – ‘nostalgia for mud’– this idea that things were brighter, better, and healthier in the past. Between 1933 and 1935, more than 5,000 children in the United States alone died from diarrhea and enteritis, due primarily caused by food-borne pathogens. Today, the rate is 1/2 of 1% of what it was in the 1930s for Americans of all ages. I don’t know if Campbell’s has made the right decision. I do know that because of today’s food processes I am healthier than my grandparents. Sure there are problems, but because of science, the trend is in the right direction, in spite of and not because of the Foodites. California’s Proposition 37, the awkwardly titled “California Right to Know Genetically Engineered Food Act,” will come to us for a vote in November’s election. The proponents say, “You should have the right to know what is in your food.” That statement is hard to argue. Our food provides our bodies with energy to go about our day. We should know what we are eating. That’s it? That is hardly enough for people to make informed decisions. We can all agree that knowing what is in our food is rather a good thing. But passage of Proposition 37 does not give you all the necessary information to learn what really is in your food. If 37’s goal is to educate people about their choices (which it purports to do) it should be greatly expanded so that people are genuinely informed. Californians do need food labels that provide information about what is in their food. 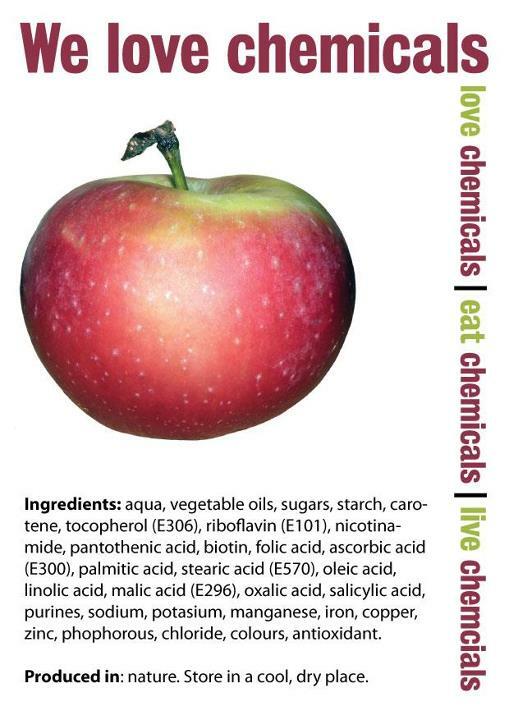 Apples contain chemicals. “Chemical-Free” apples are no more possible than oxygen-free air. Notice: This food contains chemicals. It may be a failure of our schools or “No Child Left Behind” but basic knowledge of chemistry has faded from our memories. Otherwise why would we see ads for “chemical-free” food? I am sorry to tell you that all foods contain chemicals. There is no way around that. We can no more have chemical-free food than we can have oxygen-free air. Caution: This food contains toxic chemical pesticides and chemicals that are known to the State of California to cause cancer and/or mutations. All the vegetative stuff we eat, fruits, vegetables, spices, coffees, teas, and the like, contain chemicals, some of which are produced by the plant to ward off pests. In other words, the plant is producing its own natural pesticide. Tomatoes contain benzaldehyde, caffeic acid, hydrogen peroxide, and quercetin glycosides. Orange juice and black peppers harbor d-limonene. The Brussels sprout, cabbages, cauliflower, collard greens, and horseradishes contain allyl isothiocyanate. And neochlorogenic acid lurks in apples, apricots, broccoli, Brussels sprouts, cabbage, cherries, coffee, kale, peaches, and pears. The list goes on. 2-propenyl glucosinolate (sinigrin), 3-methylthiopropyl glucosinolate, 3-methylsulfinylpropyl glucosinolate, 3-butenyl glucosinolate, 2-hydroxy-3-butenylglucosinolate, 4-methylthiobutyl glucosinolate, 4-methylsulfinylbutyl glucosinolate, 4methylsulfonylbutyl glucosinolate, benzyl glucosinolate, 2-phenylethyl glucosinolate, propyl glucosinolate, and butyl glucosinolate. 3-indolylmethyl glucosinolate (glucobrassicin), 1-methoxy-3-indolylmethyl glucosinolate (neoglucobrassicin), indole-3-carbinol, indole-3-acetonitrile, and bis(3-indolyl)methane. alylisothiocyanate, 3-methylthiopropylisothiocyanate, 3-methylsulfinylpropylisothiocyanate, 3-butenyl isothiocyanate, 5-vinyloxazolidine-2-thione (goitrin), 4-methylthiobutylisothiocyanate, 4-methylsulfinylbutylisothiocyanate, 4-methylsulfonylbutyl isothiocyanate, 4-pentenyl isothiocyanate, benzyl isothiocyanate, phenylethyl isothiocyanate. 1-cyano-2,3-epithiopropane, 1-cyano-3,4-epithiobutane, 1-cyano-3,4-epithiopentane, threo-1-cyano-2-hydroxy-3,4-epithiobutane, erythro-1-cyano-2-hydroxy-3,4-epithiobutane, 2-phenylpropionitrile, alylcyanide,* 1-cyano-2-hydroxy-3-butene, 1-cyano-3- methylsulfinylpropane, and 1-cyano-4-methylsulfinylbutane. menthol, neomenthol, isomenthol, and carvone. Phenols: 2-methoxyphenol, 3-caffoylquinic acid (chlorogenic acid), 4-caffoylquinic acid, 5-caffoylquinic acid (neochlorogenic acid), 4-(p-coumaroyl)quinicacid, 5-(p-coumaroyl)quinicacid, and 5-feruloylquinic acid. Let’s be honest: if we saw this list on a label, we would politely replace it on the shelf and decline to buy it, wouldn’t we? Even if it were in the Organics section of the produce department. I am not trying to scare you; I am trying to make the point that all foods are made up of chemicals and some of those at high dosages have caused cancers in mice and rats. Dose makes the poison. Caution: This food was grown using toxic chemicals that are also known to the State of California to be toxic and can cause cancer. Organic growers use “natural” pesticides; one of the most common is copper sulfate (CuSO4), a herbicide and fungicide. Copper sulfate has “been shown to have chronic effects” at low doses, writes Christie Wilcox, a Ph.D. in Cell and Molecular Biology at the University of Hawaii, “In animals, chronic exposure has led to anemia, stunted growth, and degenerative disease. Furthermore, copper sulfate has been shown to disrupt reproduction and development, including inhibition of sperm development, loss of fertility, and lasting effects from in-utero exposure. Copper sulfate is also mutagenic and carcinogenic.” Other than that, it is perfectly safe to use and no problem. When we insist on organic foods being grown with “only” copper sulfate, we are keeping the grower from using other pesticides and herbicides that have a shorter shelf life and, dare I say it, may even be less harmful to the farmer. Copper sulfate is approved simply because it was the only herbicide available 100 years ago, and is therefore considered “natural”—not because it is inherently good. Notice: This organic food was produced in ways that exposed farm workers to poisons and may contain traces of the pesticide. Wash thoroughly. CuSO4 is two to ten times more poisonous than the synthetic alternative, chlorpyrifos, used in conventional farming. Christie Wilcox notes, “organic pesticides do make farmers sick. They do bioaccumulate. They do harm non-target species…. [and] organic alternatives are applied in higher concentrations and more frequently because they’re less effective at controlling the species they’re meant to kill.” Other than that, they are perfectly safe to use and no problem because it is a natural chemical pesticide, right? So farmers have to risk developing unnecessary illness so I can feel righteous about the food I am eating. Notice: This certified organic food has no more nutritional value than conventionally grown food despite the higher price. Numerous scientific studies have found no difference in nutritional value between organically produced food and food produced using synthetic fertilizers and pesticides. Plants do not distinguish between chemicals they need for growth being provided by manure or fossil-fuel derived chemicals. Studies have borne out this fact time after time. I can understand skeptics not trusting government studies (“the study’s authors were paid by big ag!”), but have you ever heard of the Mayo Clinic being accused of taking sides? It costs more due to lower yields and higher labor costs (and organically-certified food currently fetches a higher price); not because it is more nutritious. More is labor needed to produce organically-certified food (weeding and hoeing doesn’t come cheap, not to mention the damage tilling does to the microorganisms in soil). When you take into account the need to let organic fields go fallow, organic practices do not yield as much per acre as conventionally produced crops. Notice: This organic food may not be more flavorful than conventionally grown food. “Okay, now you have done it,” I hear you say, “That just cannot be true. I know it tastes better.” A 2002 report for the British Food Standards Agency said, “While there are reports indicating that organic and conventional fruits and vegetables may differ on a variety of sensory qualities, the findings are inconsistent.” In other words, they found mixed results: some experiments indicated that conventional tasted better, other experiments that indicated organic tasted better, others found no difference. Better yet, do not take their word for it, do your own double-blind test. Pick out similar (e.g., store bought or garden grown but compare like with like) organically grown and conventionally grown fruit and vegetables. Then have someone else prepare and mark the underside of the dish. Then have another person serve them to you and your friends. Pick out the ones you think taste better. If you are like the participants in Penn & Teller’s test (available on YouTube, where they cut a banana in half and asked the participants which was organic), you will believe you can taste a difference. The participants in the test were told that one half was organically grown, the other conventionally grown. Most people decided they could tell a real difference between the two, when in fact they were taking bites of different halves of the exact same banana. It is difficult to measure the effect the mind has in effecting your perception of taste. That is why you must do a double-blind test. Caution: Wash thoroughly. Organic food may be higher in E coli and other pathogens that are hazardous to your health. And as a side note, a recent study about the effects of San Francisco’s ban on plastic bags, emergency room visits for E. coli infections spiked and remained high as soon as the ban went into effect. While the regulators are concerned that an organic food touching a nonorganic food contaminates the organic food, I believe the concern should be in the reverse direction: should organic food touch my conventionally grown food, I would fear E. coli transfer. Notice: This meat contains hormones. While they may be natural, they are hormones. All animals (and plants) use chemicals to regulate their functioning in their environments. Notice: This food contains DNA and RNA. All food contains genes and its building blocks: DNA and RNA. We cannot have food without chemicals, hormones, and DNA and RNA. Food was living matter in the recent past, and you just cannot escape these components of living matter. ALL foods contain hormones, genes, and DNA and RNA, even certified-organic food. This should not need saying but it does; all food contains genes and its building blocks, DNA and RNA. A 2010 national study, 41 percent of young adults were not sure that the statement, “Ordinary tomatoes, the ones we normally eat, do not have genes whereas genetically modified tomatoes do” was false; 17 percent thought it was “probably false,” and only 42 percent knew it was “definitely false.” For the record, the statement is false. Caution: This food contains the result of cross-breeding; 10,000 to 300,000 recombined genes have changed and their responses remain, at best, a guess. While GE foods have had 1 to 3 genes replaced, standard cross-breeding rearranges 10,000 to 300,000 genes “depending on the species,” says Dr. Kevin Folta, an expert in Molecular Biology. Caution: Amounts and types of proteins and metabolites present varies from plant to plant and may have been altered as a response to stress while growing in the field. Notice: This certified-organic food needed more land than food grown with man-made fertilizers, genetically engineered foods, or pesticides. While its supporters say, “It doesn’t cost anything to include information on a label,” that is not quite true. California’s Legislative Analyst estimates that the requirement will cost us Californians (through increased taxes or budget cuts to other services elsewhere), “a few hundred thousand dollars to over $1 million annually.” That’s just the state’s administrative costs; that estimate does not include the higher food prices you and I will pay for settlements of lawsuits against food companies allowed under this proposition, and the added time to print and place labels on food or restock the shelves with politically correct food (which, unless the food is organic, the store retailer (even a Farmer’s Market! will need get sworn affidavits for the food’s origin). Contrary to claims, it will cost quite a lot to label GE foods. Not to us in California or the U.S., mind you,because there will not be any GE to label. Everywhere GE labels have been introduced, GE food has not made it to the shelves. Not necessarily if Peter Kareiva, the chief scientist at The Nature Conservancy, is correct. Once the U.S. market is gone (as California goes, so goes the nation) there will be major repercussions throughout the developing world. “The stakes for the debate on GMOs could hardly be higher for nature, people and conservation,” Kareiva says. “Agriculture takes up more land and consumes more water than any other activity on Earth. And agriculture is bound to eat up even more land and water as the human population soon zips past 7 billion on its way to 9 billion by 2050. Notice: Due to Proposition 37, many African farmers cannot sell their produce here and, as a result, remain undernourished and impoverished. Prop 37 supporters will tell you that they are simply trying to shine a light on the truth about our food and that “Monsanto and some other chemical and agricultural biotech companies are desperate to keep the public in the dark about what is really in their food,” Gary Ruskin, an Oakland-based manager for the campaign, told Bloomberg news in an April 30 interview. But, it is they who do not want to illuminate the debate, otherwise they would have written Prop 37 to show what is really in your food and what your food choices really mean to our environment. Not really. Proposition 37 appears to be an old story: large companies lobbying the government to hobble their competitors and thus increase their own profits. The proposition’s backers include Big Karma companies such as Mercola.com Health Resources LLC, Nature’s Path Foods Inc. and Dr. Bronner’s Magic Soaps All-One-God-Faith Inc. All of which could see their bottom lines improved if Prop 37 is passed. The proposition’s drafter, lawyer James Wheaton, also stands to make tidy sums of money through lawsuits, just as he did following the passage of Proposition 65. And, Big Organic is licking its chops for a bigger share of profits. “The burning question for us all then becomes how—and how quickly—can we move healthy, organic products from a 4.2% market niche, to the dominant force in American food and farming?” Organic Consumers Association Director Ronnie Cummins wrote in an open letter earlier this month. Once you know the truth (about GE and its opponents and natural chemicals and natural pesticides), it will set you free. Bon appétit. Disclosure: To my knowledge, I own no shares in any agricultural biotech company. I receive no compensation, other than lower prices at the market, from any biotech firms or organizations or any farming cooperative, organization, lobbyist, company, etc. Since I buy at Costco, I do eat and buy organic food. I also compost and recycle. http://kfolta.blogspot.com/2012/06/more-frankenfood-paradox.html accessed 28 June 2012. Miller, J. D. (2012, Spring). Food: Shared, Prepared, Organic, and Genetically Modified. A Quarterly Research Report from the Longitudinal Study of American Youth, Volume 1 Issue 3, p. 5. Kaskey, Jack “California Heads for Vote on Modified Food Labeling” Bloomberg http://www.bloomberg.com/news/2012-05-02/california-heads-for-vote-on-modified-food-labeling.html accessed 3 May 2012.